What are Definite Workout Spaces? 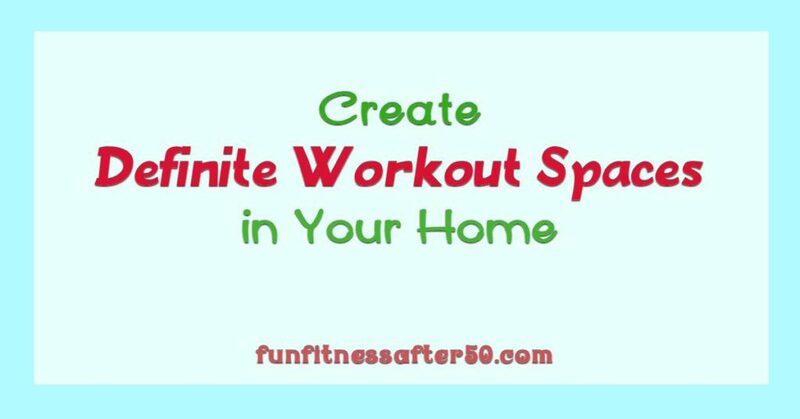 Creating definite spaces for working out at home has many advantages. Even if you like the gym or spend a fair amount of time outside, having quick options at home can give you flexibility no matter the weather or schedule issues. Such spaces don’t need to be complicated, they just need to be reliably quick and easy to use. I have all 3 types at my house and I will describe them to you as I talk about each of them. This is what most people think of when they think of creating a place to workout at home. While a gym may be the ultimate example of a dedicated workout space, you do not need a whole room. You just need enough space for a specific piece of equipment. One thing we make space for is spin bikes. We are able to fit 2 spin bikes side by side in our bedroom. 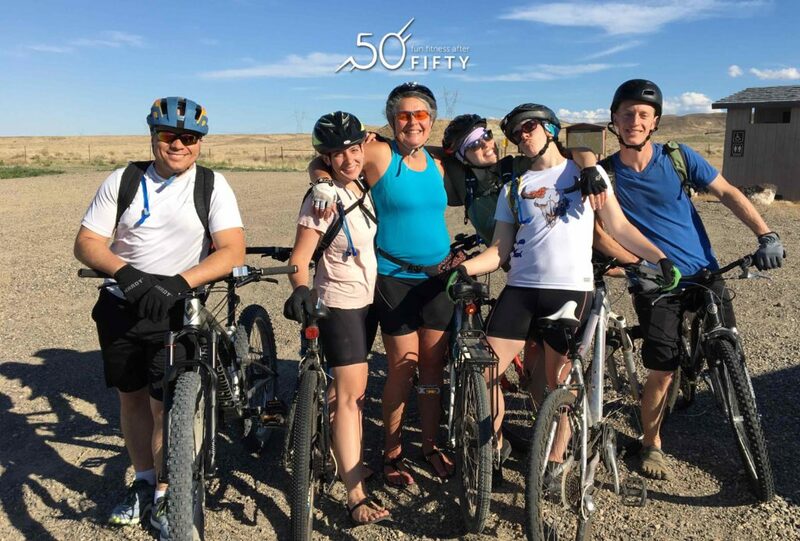 They do not need to be as spaced as you usually see them in spin classes. For one thing, they are not always used at the same time. For another thing, two people are using them at the same time at home usually want to talk to each other. There just needs to be enough room for pedals to turn. Spin bikes don’t need a lot of room. Even though my swimming pool is outside, I will mention it because it IS the kind of pool you can fit in an average room or garage. It is also an example of having multiple uses, even though exercise is the main reason we built it. The swimming pool is used for playing with grandkids, lounging with friends, and even the occasional evening dance party! Having something take up space for exercise can be done in creative ways. Having equipment handy will make it more likely that you will use it and exercise, but it doesn’t always have to dominate the space. Most of our equipment in this category has to do with isotonic exercises, or exercises thought of as ‘muscle building’. I don’t just say “weight-lifting,” because although we are doing similar exercises, most of this equipment is taking advantage of our own body weight. The TRX strap is very popular around our house. Almost everyone has their own, which is easy since a TRX strap basically takes up as much room as a big belt. Although we have owned and used them for several years, I only recently became an affiliate advertiser for the company. This means that if you buy a TRX through one of my links, I receive a small commission as no extra cost to you. A TRX strap can hang over a door anywhere that you have enough room to work with it. How much room you need will depend on which exercises you want to do. The space we usually use is a little more than a door wide and about a body length long. There are a LOT of videos online with exercise ideas. The TRX also comes with a basic guide. When not in use, the TRX basically has no 3-D imprint. We leave ours hanging on a bedroom door. Once in a while it swings enough to get in the way of closing the door, but not very often so it is worth that small inconvenience to have the important convenience of having it up and ready. I asked for some small free weights for Christmas. I just like the feel of them. I plan to have them mounted ‘decoratively’ on the bedroom wall, so they will also not take up much room, but will be easy to pull down and use. To be truly everyday transitional, it must not take very much time or effort to get the space ready to use. Pulling out a yoga mat or moving the coffee table count as transitional in our house. My husband recently added a balance board to the mix based on a physical therapist’s recommendation for strengthening his hip. It actually ended up being huge advantage when he tried out the paddle board in Maui. He was able to stay up much better than two years ago. He even did a 1.5 mile out into the ocean on one trip out, so, yeah, 3 miles round trip on the paddle board standing up the whole time except for a short rest on his knees at the turn around point. He was with a friend, too. 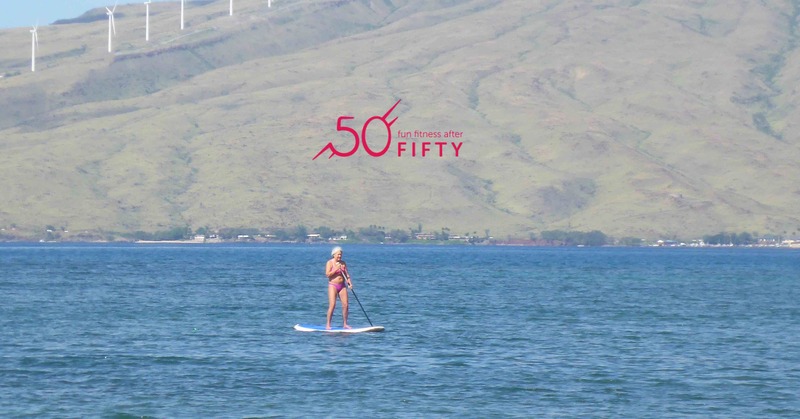 I also tried a little paddle boarding, but I had the flu most of the time we were in Maui, so I am satisfied with the 50 meters off shore that I managed. First time ever standing on a paddle board. Off the coast of Kihei, Maui, January 2018, while still recovering from the flu. There are ways to transition spaces that you wouldn’t do every day, but still might want to keep in mind. For instance, you probably don’t have to move a lot of furniture to have as good of a dance floor as most pubs do. Clearing a path to chase the grandkids can be pretty fun, too. I don’t feel like I live in a gym. I like to decorate and have colors be coordinated. However, I am also big on practicality. Make the spaces you have work for you and your life. People don’t live in magazine presentations. Don’t forget that you can also decorate around and in ways that incorporate your exercise equipment. Maybe some fun stenciling will be in order around my free weights? Or a nice looking basket to keep ready-to-use yoga mats in? This might also keep the dust off of them! How can you optimize the space in your home for your workout goals? I don’t always like to do the same thing while I’m riding my spin bike. I’ve made a list before of things I find interesting to do during this stationary exercise, but the one time I had tried to crochet it had only gone well for about 10 minutes. After that, I had ended up with the yarn wrapped multiple times around one pedal. Fortunately, I noticed before it was a huge mess. At that point, I decided not to mix those pursuits again, at least for a while. 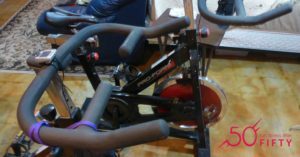 Most of your workouts on the spin bike should be comfortable and building your base of endurance anyway, so it is quite possible to knit or crochet at the same time. Then, last week, I really wanted to teach myself to knit using youtube videos while I road the bike. Who knows why these things become so important all of a sudden. I had previously watched a couple of helpful video segments by Expression Fiber Arts on my computer. Now that youtube is on the Roku, I knew I could watch it while pedaling. I gathered all my knitting supplies hopefully, but not really having any idea of what I was going to do about the previously discovered hazard. I have a TV tray set up next to my spin bike so that I can easily reach items I put on it, but not hit it with my pedals or knees. I set my knitting supplies on it, put my water in the cup holder, and proceeded to climb on and begin pedaling. That was when the cute little bag on the handle bars caught my eye in a whole new way. One of my daughter-in-laws had made it for me and I was using it as a way to store TV, DVD player, and Roku controls within easy reach. Now, I saw that it would probably hold a ball of yarn perfectly. The magnetic clasp at the top was the extra touch that kept the yarn ball from being dislodged and bounced across the floor when I pulled out a new section of yarn. 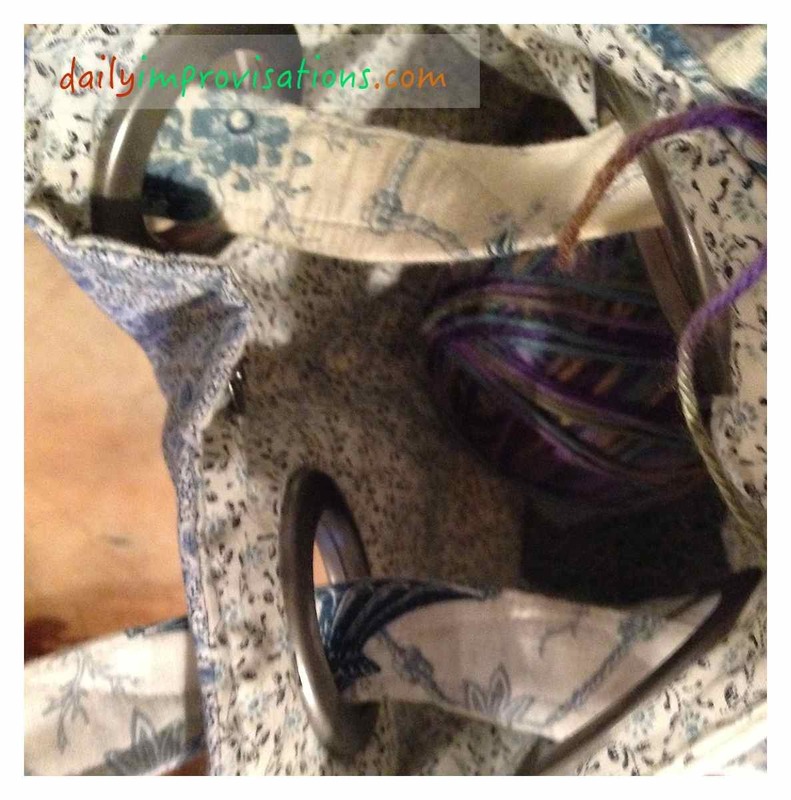 The yarn extending from the bag to my hands and needles draped over the top of the handles, and sometimes rested on my knees, but never even came close to getting tangled anywhere. Here is the yarn in bag that is hanging on the handles. Thus it was that I spent the 60 minutes working up a moderate sweat, but also relaxing with my new knitting project (a head band – see embedded video below). It’s kind of like singing while you work in the garden. Not distracting multi-tasking, but complimentary activities. 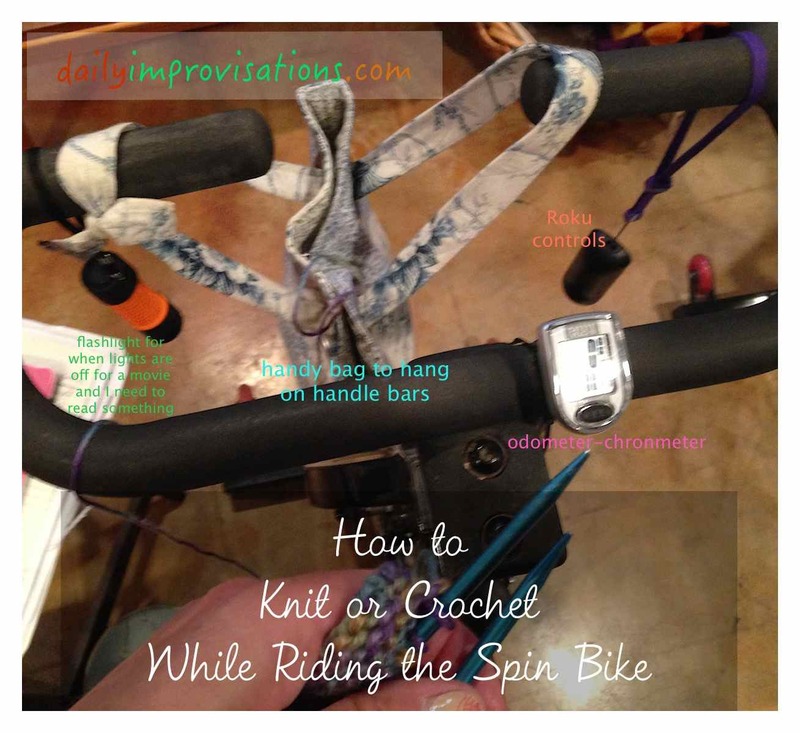 If I can learn to knit, I’m sure I can also crochet there, although any of these projects would have to be limited to smaller things to be spin bike compatible. Afghans would be too hot and cumbersome. 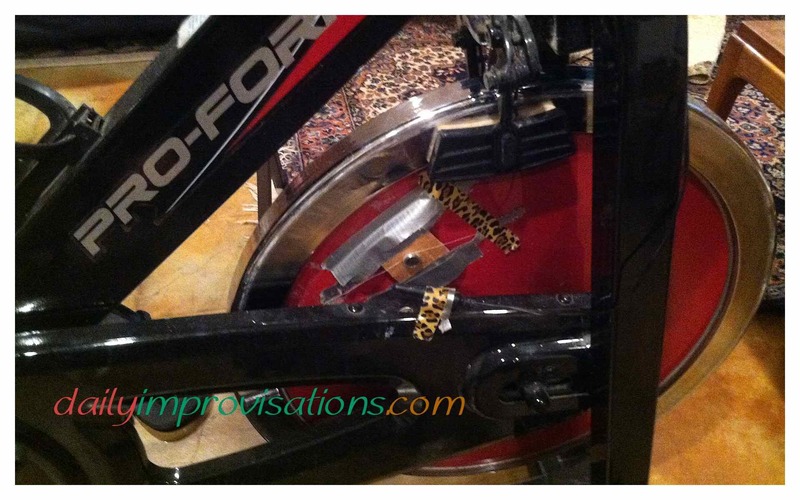 When I want to have stand-up power-pedaling intervals, I don’t think it will be hard to set my needlework aside and pick it up again for the recovery period, as this first time around I had to fiddle with the controls a lot. I rarely watch things on the TV by myself, so have limited skills in the area. And much less patience with learning about TV controls than I have for learning to knit and crochet. I’ll still be trying to get outside for bike riding more as the weather warms and the days lengthen, but I’m wimpy about cold wind and dark roads. I can run in all kinds weird conditions, but the thought of bike riding in the cold or dark makes me want to cry. Instead, I will stay inside on those kinds of days, experimenting with knitting and crocheting while I spin. When I wrote up my custom marathon training plan about 10 weeks ago, I knew I needed to have a flexible attitude. Things happen. However, I am happy to report that so far “things” have been manageable and basically injury free. I don’t say completely injury free because I have had a couple of small flesh wounds and a bruise. 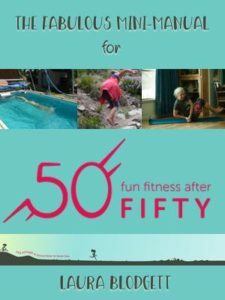 These have not slowed down my training, and have been minimally discouraging to my barefoot training, since my regularly shod and experienced husband/coach has had similar issues. Life is rarely totally injury free, even if a body holds still. 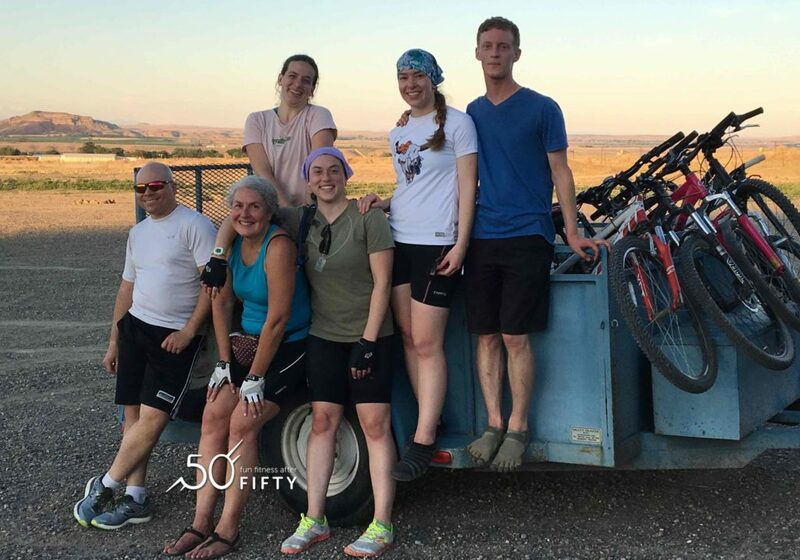 For me, the things to be flexible about have included camping (somewhat against my will) and other travel, accommodating my husband’s highly variable work schedule when he wanted to run with me, weather, female hormones, unexpected scheduling conflicts, and my body’s needs for rest. Most of these issues have been more noticeable as I have worked on ramping up my mileage, which obviously takes significant time and in larger chunks. And, even though I have been increasing the physical load gradually, it still uses more energy than running fewer miles. This means that the need for adjustment became more crucial during the last 3 -4 weeks. What needed to be modified did not become apparent all at once, but that is okay, because I benefited from waiting to see how some issues would settle out, and time to problem solve a bit at a time while I kept working on things. Camping and travel and my husband’s work schedule ended up making me shift my first of the week long runs, which in turn meant I couldn’t space my other runs for the week quite the same way and get in my weekly mileage, which my husband/coach tells me in equally important to increasing the length of my long runs. So, I discovered that I could actually run three days in a row at this point in my life, if they are medium to short runs. That was a confidence booster. Another thing camping did was add some elevation and trail running to the routine. I plan to describe this more in a later post. For now, I will say that this was very refreshing to my training, both mentally and physically. Who would have thought that about running at twice the elevation I am used to?! These training schedule changes made us consider the order of my runs compared to their length. I decided to regularly switch the medium-long, mid week run with the short run on Friday, to give me more of a rest after my long run. Again, this only became important after the long runs passed 18 miles. My husband also counseled me to spread out my mileage between my medium and short runs more, so that my medium one didn’t get long too fast. At this point, four or five miles feels pretty short, so it was not hard to increas the shortest 3 mile run to do that. I have done that for two weeks now, and it has helped me. I have not been able to increase my swimming time the way I had hoped. This is partly due to not being home on some camping weekends, and the rivers were icy, hypothermia inducing cold. All that went in the water, other than the hot springs, was my feet. Still, swimming 2 – 3 times a week has been unexpectedly relaxing since it is not part of triathlon training this summer. I had hoped to get out on my road bike more, but almost all of my bike rides have been on the spin bike. I find this to be acceptable because I can do it early in the morning without dealing with rush hour traffic. And, as I have mentioned before, it doesn’t have to be time exclusively dedicated to training, as I can get other things done while riding. It has been surprising to me how much a spin on the bike post long run helps my legs recover, I am assuming by getting the blood circulating, but letting the harder working running muscles ease up. As I wrote about when telling about accomplishing my first 20 mile run, things are looking hopeful. Still, I wonder how anyone trains for a marathon in less than 20 weeks, especially their first. Even with two half marathons under my belt, I feel like to stress my body with more training would be fool hardy. And pretty much incapacitate me for any other aspects of life. I want this to be part of my life, but I don’t want relationships to suffer from it, or for this to be all I do. I am happy to say that I am already looking forward to how it might be different for a second marathon, when my body is somewhat used to longer distance, so, again, a good sign even though I am only half way through my training period! We have had our Pro-form 290-SPX spin bikes for about 3 years now. The first year, they were quiet. The next year (approximately… ), they began to talk to us loudly. The noise of their loud, squeaky voice said, “You should look at our brakes.” Some of the pads were worn at a slanted angle. Taking them off, turning them around, and putting them back on kept them quiet for a while. Soon, however, they were squealing again. A couple of the pads seemed to be getting thin everywhere, but the other pads looked “okay”. It wasn’t clear why that would make such a bad noise. They didn’t seem to be touching metal to metal anywhere. Ever trying to learn to do these things myself, I searched the internet far and wide for replacement pads. The only option I could find was replacing the whole brake apparatus, and even that wasn’t very clear. I gave in and told my engineer I needed help. Naturally, he had found a possible fix within minutes. A bike forum suggested a silicone spray lubricant, but he didn’t tell me. He secretly bought a can of fabulous (it says so, right on the can) Blaster® Industrial Strength Silicone spray lubricant at Walmart, and wrapped it for one of my Christmas gifts. He was quick to explain when I opened it. “Think of it as new bike brakes.” Apparently, the fibers of the brake pad dry out and fray, leading to the horrible squeaking. I believe he got to playing with it that very day. He took the brakes off and saturated the brake pads with the stuff. Voila! No more squeaking. They have been good for a few weeks now. He now says we should probably have done this to them regularly since they were new. There is always something that could be done better to maintain things! Brakes on Pro Form spin bike are not in the way of putting a bike computer on the wheel.